The raucous crowd had dwindled to a few dozen hangers-on. The international reporters had returned to their hotels, and Tesla’s billionaire chief executive, Elon Musk, had disappeared into his sprawling Fremont, Calif., factory about an hour earlier. 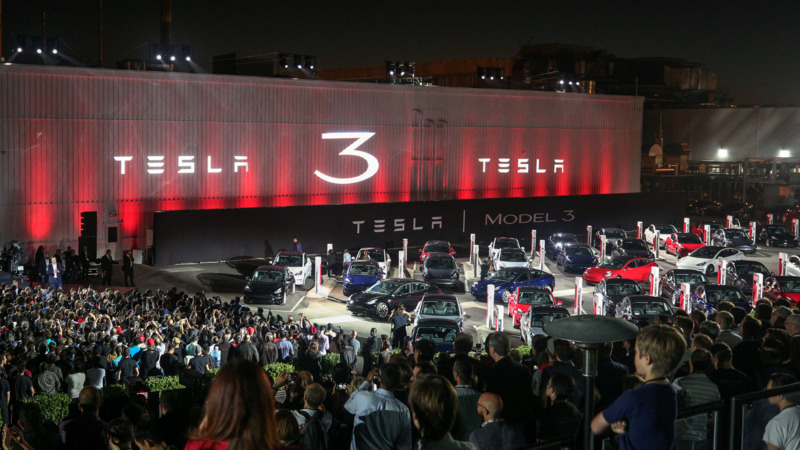 Tesla’s Model 3 rollout was essentially over, but in a nearby parking lot where the first test rides of the electric car were being offered, the night’s enthusiasm had yet to wane. In almost any other circumstances, a silent, three-minute ride around a poorly lit factory parking lot that barely cracked school-zone speed limits would’ve been a laughably underwhelming experience. But for many riders, myself included, this time was different. One spin in the Model 3 just wasn’t enough. Journalists, factory workers and their family members, and random revelers on hand to celebrate returned to the back of the line over and over again as if the understated electric sedan were a futuristic carnival ride. “Can we do it again?” a woman asked. It’s quite likely that the effusive reactions were at least partly influenced by Tesla’s sustained PR campaign. Company handlers had been force-feeding attendees a diet of Model 3 exuberance for several hours in the form of mesmerizing videos, splashy lights, upbeat dance tracks and free drinks –giving people the feel of having an exclusive backstage pass to the automotive future. From the moment you sit inside the Model 3, you do sense that you have entered uncharted territory. What made the experience unique, is the equally immediate sense that this uncharted territory is actually familiar. Call it driving déjà vu. I attribute that feeling to the intuitive nature of the Model 3’s minimalist design. But it also has to do with the way the car seamlessly incorporates technology that is already second nature in many people’s everyday lives. Instead of peering into a cluttered dashboard, for example, you see critical information about the vehicle arriving via a clean, 15-inch display that will look instantly recognizable to any smartphone user. That said, the door handles may take one or two tries to get used to. I got carried away and waved my hand over them expecting the Tesla genie to open the door for me. Alas, the year is 2017, not 2117. Devoid of buttons and the typical instrument cluster in the driver’s line of sight, your eyes are drawn instead to the road ahead. The windshield wipers, headlights, mapping, temperature, music and steering wheel can be adjusted with a few taps by on the horizontal display. The speedometer is also prominently displayed here, in the upper left corner, a feature that our driver said initially caught him off guard, but now seems safer and more intuitive than glancing behind the wheel to check your speed. It’s not so much that Tesla is ushering in the future. After riding in the Model 3, I’m more inclined to think that Tesla is single-handedly pulling the automotive industry into the present – the way anyone born before the Internet thought 2017 would look like decades earlier. The Model 3 — touted as the first “mass-market” electric car — will start at $35,000, go from zero to 60 miles per hour in 5.6 seconds and have a top speed of 130 miles per hour. The car has a range of 220 miles to 310 miles and has been designed to “have the highest safety ratings in every category,” the company said. “This car feels like an automotive tipping point, a sign that electric vehicles — and hopefully, the infrastructure that supports them — have finally come into their own,” Wired’s Jack Stewart observed. To be fair, Tesla, for all its revolutionary rhetoric, is hardly the first vehicle to enter this space. Prospective buyers are already comparing the Model 3 to the Chevy Bolt, Motor Trend’s 2017 Car of the Year and the 2017 North American Car of the Year. The Bolt’s 240-mile battery range is slightly longer than the base Model 3’s 220-mile range. The “long range” premium Model 3 can go 310 miles before it needs more juice. One major difference between the vehicles, however, is price. With incentives, the Bolt is available for less than $30,000. With incentives, the base Model 3 is comparably priced, but packages and options can nearly double the price tag. A Model 3 with every premium option would cost about $60,000, according to the latest details released by the company. The competition, it seems, has begun.